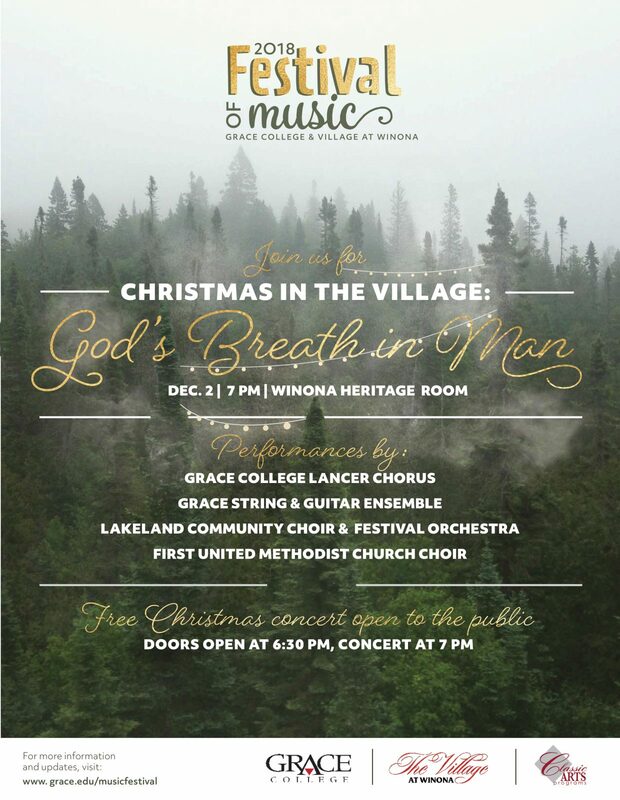 The Grace College and Village at Winona Festival of Music will conclude for the year with two Christmas concerts. 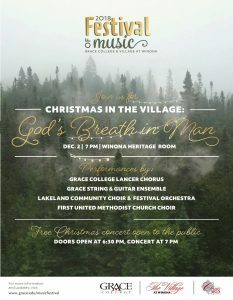 This Sunday, Dec. 2, the Grace College Lancer Chorus and String and Guitar Ensemble, First United Methodist Church Choir, and the Lakeland Community Choir & Festival Orchestra will present “Christmas in the Village: God’s Breath in Man.” The concert will take place at 7 p.m. in the Winona Heritage Room, 901 Park Ave., Winona Lake, Ind. Doors will open at 6:30 p.m.
On Friday, Dec. 7, the Grace College worship arts program will present a Christmas recital at Winona Lake Grace Brethren Church, 1200 Kings Highway, Winona Lake, Ind. The 7 p.m. concert will feature worship arts students sharing solo works as well as choral, string, and guitar ensembles. “We hope that many from the community will come out to celebrate Christ’s birth with us through music this weekend and next,” said Dr. Walter Brath, 2018 Festival of Music coordinator and director of worship arts at Grace College. “The 70-voice chorus and full orchestra at Christmas in the Village should be a powerful and inspiring sound,” he said. Brath added that he would be delighted if the event became part of the annual Christmas tradition in Winona Lake. The 2018 Festival of Music is sponsored by Grace College, Wagon Wheel Center for the Arts and The Village at Winona. For more information, please visit grace.edu/musicfestival.